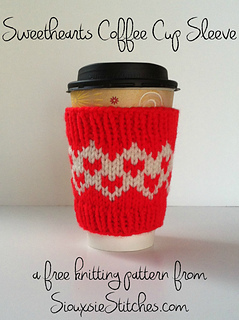 Your Valentine’s Day coffee date will be extra sweet with the Sweethearts Coffee Cup Sleeve! Knitted with sturdy and washable acrylic yarn (or superwash wool if you prefer), this sleeve simultaneously protects your hands and decorates your coffee cup. Plus, it easily works up in an afternoon, so it’s a great quick gift–especially when given with a gift card to a favorite coffee shop!